Commercial doors are built to be durable and withstand use and abuse from customers and staff, and in the case of exterior doors the elements, too. At a certain point enough is enough and even the most solidly built commercial doors will need to be replaced. Here’s what to look for to determine when to install new doors and locks at a commercial business. Make it a habit to regularly inspect all of the doors at your business, particularly exterior doors. Look for signs and wear and tear that may compromise the structural integrity or security of the doors. When you notice a loose door knob, hinge or other issue fix it. Regular maintenance can extend the life of commercial doors and mean they will need to be replaced less frequently. A locksmith should periodically check your locks and security system to ensure they are functioning properly. The type of door installed needs to fit the purpose and function of the space. For instance, an automatic door is usually a great fit for a customer entrance while an overhead door is necessary for a loading dock. The most basic of all door designs in the pass through door. Pass through commercial doors can be used in any application where people need to walk through. When moving equipment or large items a pass through door is not ideal. From swing doors to more traditional styles with a door knob and lock there are many applications for pass through doors. Doors that operate automatically are ideal for customer entrances. Automatic doors require regular maintenance to ensure everything is in proper working order. An automatic door may present a safety issue if it breaks, so it is important to be proactive about replacing this type of commercial door at the first hint of a problem. There are different styles of overhead doors. Rolling overhead doors are made from steel and coil above the doorway. Sectional overhead doors are typically used in garages, and are made up of hinged panels that roll on a track. Sectional doors can be made from wood or steel. This style of door is common at loading docks or in areas where large equipment or objects need to be moved. Different materials wear differently, so consider the type of material when inspecting your commercial door or shopping for a new door. Wood doors are constructed using thin sheets of wood, called veneer that are applied over a core made from particle board, composite material or solid wood. This construction does not offer a high level of security or withstand the elements. Wood doors are best suited for interior use. Most exterior commercial doors feature a steel construction. Steel doors feature a core material that can be foam or a resinous material wrapped in steel sheets. The construction is durable in terms of withstanding regular use and holding up against the elements. This durability also comes in handy for security applications. For this reason steel doors are sometimes used as interior doors. Commercial entrance doors are often made from aluminum. This lightweight metal provides a sleek and modern look with clean lines. Doors made from aluminum are generally low maintenance. Aluminum is sometimes paired with glass panels that allow natural light to pass into the building. Aluminum does not offer the same level of fire rating that steel does provide, so depending on the local codes this may not be the best option. Glass can be used for both interior and exterior applications, and either in a metal frame or on its own. Glass doors allow for light to pass through and create clear sight lines which can create the sense of a space feeling larger and more open. When choosing a glass door consider the various safety glass options available. Essentially, this means there is a reduced risk of harm if the glass breaks. Most codes mandate safety glass be used in commercial applications. When it comes to durability fiberglass is usually the best option. Fiberglass is made by embedding glass fibers in a resin material. The resulting structure is low maintenance and will last for a long time. In high use and abuse scenarios fiberglass is a great option. Fiberglass is usually expensive. However, in the long term fiberglass commercial doors may end up saving money by the way of no maintenance costs and extending the time between replacement. 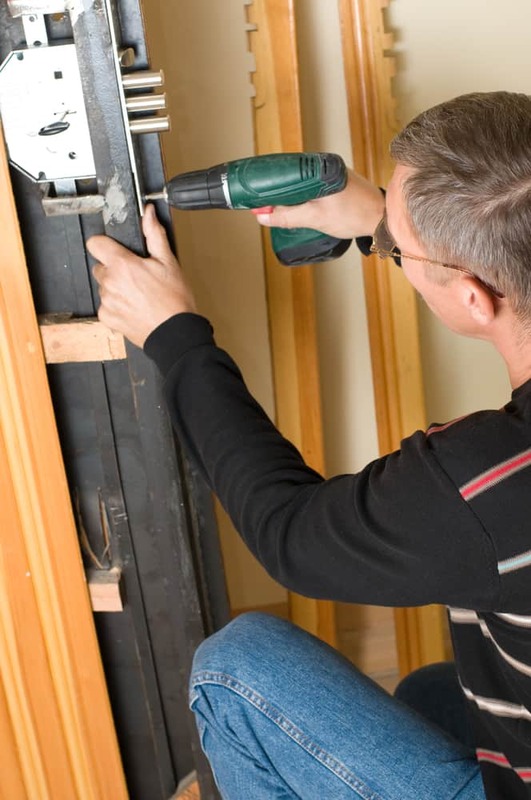 When replacing a commercial door consider how the previous door held up. If the style or material were not a good fit for the application this is a good opportunity to replace the old door with a better option. Discuss locks, security, and access options with a Seattle locksmith to achieve the highest level of security. Safety regulations also come into play when looking to replace commercial doors. Before making a purchase double-check the rules or regulations for commercial doors. Make sure your new commercial door lives up to all of the necessary requirements and safety codes. Hire a locksmith to install all the locks and security systems for total peace of mind.